Fittingly, Season 12 of Mystery Science Theatre 3000 made its debut on Thursday, November 22nd! Subtitled The Gauntlet, the new 6 episode season can be viewed now on NetFlix. There are a few changes this time around, First of all the season has been scaled back to only 6 episodes, also the faux "commercial breaks" are gone and one host segment has been eliminated. The subtitle Gauntlet means this season is supposed to be binge-watched. Six episodes in one go, not only for the viewers (optional), but for Jonah and the bots (mandatory). Finally, the riffing has been slowed down a bit in order to give the viewers a chance to digest them and laugh at them. Mac and Me (1988), director Stewart Raffill’s box-office-failure fantasy film about a wheelchair-bound boy and his NASA-escaped alien friend, MAC (Mysterious Alien Creature). Atlantic Rim (2013) director Jared Cohn’s strategically-titled Pacific Rim-capitalizing kaiju genre offering. Lords of the Deep (1989) director Mary Ann Fisher’s undersea sci-fi thriller, which managed to arrive a few months before that summer’s major undersea effort, James Cameron’s The Abyss. The Day Time Ended (1980) director John “Bud” Cardos’s genre-masher, depicting a middle-class family’s encounter with extraterrestrials, which leads to them being whisked back in time to a prehistoric era. Killer Fish (1979) director Antonio Margheriti’s horror film about an undersea jewel heist in piranha-teeming waters. Big-name headliners Lee Majors and Karen Black were not able to salvage this one from Davy Jones's Locker. Ator, the Fighting Eagle (1982) director Joe D’Amato’s Conan: The Barbarian-capitalizing fantasy actioner, depicting a swords-and-loincloth-rocking tale about a warrior who must rescue his step-sister/love-interest from the dark priest (and his cult,) who slaughtered his village. 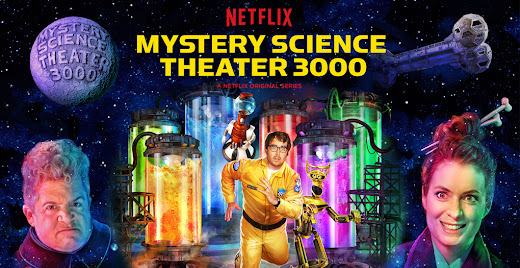 What do you think of the new season of MST3k? Sound off in the comments below!